When it comes to marketing, trends are always changing. There's always a new technology or a new product that promises better results with a more significant return on your investment. However, the big brands and savvy marketeers know the secret to a successful marketing campaign. And, they aren't limiting themselves just to online marketing tactics or modern gimmicks. 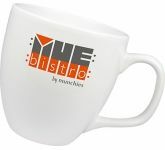 No, they're using promotional business products, and printed mugs are on top of their "must-have" lists. But why? What kind of pulling power do these simple products wield? 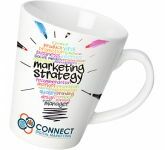 When it comes to low-cost marketing, branded mugs are the very best choice. If you have a small or a medium-sized business, you don't want to overspend on a huge campaign. That's why UK printed coffee mugs are the way to go. They are cheap to get and have an amazing impact on people who receive them. 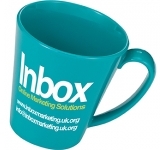 According to research, 85% of people who receive printed mugs will do business with the advertiser. What every company wants and needs is brand recognition. You want people to be able to recognise your company in an instant. You want the mere sight of your logo to be enough for them to remember what kind of products/services you're offering. 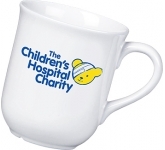 Promotional mugs are the perfect giveaway for this purpose, because people who get them will keep them. Drink their coffee or favourite beverage out of them. Put them on their tables in their offices. 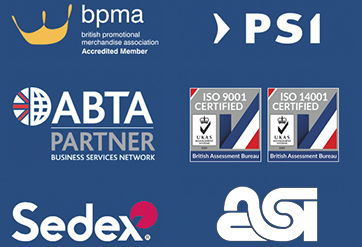 Your logo will be right in front of them for hours each and every day, and not just them, their colleagues as well! 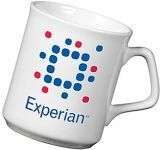 Mugs give value to both you and your customers. 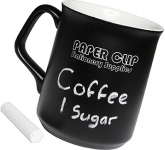 Since more than 500 billion cups of coffee are drunk every year, mugs are always needed both at home and the office. So, their value lies the fact that a person who gets and uses your mug is advertising you. Now think how much would you have to pay someone to carry your advertisement around their office? Or to tell people about you? That's what personalised mugs do. They tell your story to everyone, boosting brand recognition, sales, as well as a positive attitude towards your business. 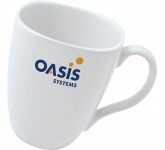 One of the main reason why custom mugs are so popular within the marketing and business community lies in their simplicity and versatility. You can print literally thousands at once, and the more you print, the cheaper they are. There's always a practical use for them no matter what the occasion. Going to a trade show or exhibition? Give away mugs. Attending a conference or business seminar? Bring printed travel mugs. Need a reward for your valued employees? Give them bone china mugs. Need to promote your club? Distribute mugs. People visited your company or event, and you want to give them a gift? Mug time! With most promotional tools, you have no idea what the return on your investment will be, or worse, if there will be one at all. You can make estimates and hope for the best, but to be honest, it's a gamble. However, with low cost printed mugs, it's not. 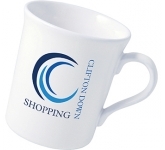 According to industry research by the BPMA, the very fact that you gave a mug to a potential customer almost guarantees that that person will come to you when they need your products or services. 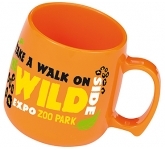 The research is simply plain for all to see when it comes to how promotional mugs can help your business! 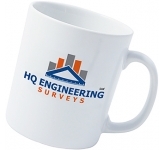 Another great thing about company logo mugs is that you have so many choices to select from. You can make something original and interesting, a design that will both draw attention and be memorable. 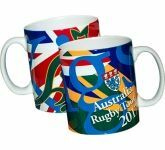 Ceramic mugs or chalk ones, china mugs or those with a colour coat, heat changing mugs, glass mugs, porcelain mugs, promotional photo mugs and plastic mugs - the options and combinations are endless, offering limitless branding opportunities. 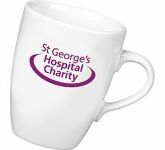 We offer a variety of printing options on our range of mugs from screen printing and etching through to UltraHD dye sublimation photo print technology allowing us to reproduce full colour images and logos to a standard most can only dream of. 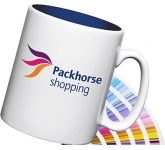 In addition, why not consider maximising your branding reach with our range of Pantone Matched promotional mugs which are sprayed with an intense colour to match your corporate branding. 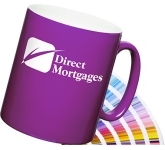 Imagine how impressed your clients will be when they receive your promotional coffee mug, uniquely customised to your corporate colours! Our team of professional graphic designers are always on hand to offer expert advice in product selection to ensure that your artwork is reproduced to the highest quality. 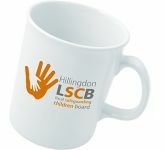 So, if you are looking for low cost, budget, discount, value or cheap promotional mugs, and happen to find the same logo mugs cheaper, with the same print specification and turnaround, just let us know and we will match the price and back it with our industry Award Winning Customer Service - that's our guarantee! 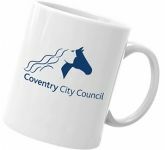 For additional information on how to choose the right printed coffee mugs for your brand, simply give us a call, say 'hello' and speak to one of our dedicated account managers.